Michael Keaton and Dylan O’Brien were the big names in the 2017 counter-terrorism thriller American Assassin, based on Vince Flynn’s 2010 novel of the same name, but the real star was surely the Itama 62. This 19 metre speedboat stole the show in a spectacular chase scene, which involved O’Brien jumping onto the moving yacht. Built in Italy as part of the Ferretti Group’s extensive range, the Itama 62 has a top speed of 40 knots thanks to twin MAN V12 engines and can accommodate up to six guests in three cabins. Sir David Attenborough recently returned to the small screen with his latest BBC nature documentary Blue Planet II. The renowned naturalist certainly knows how to make an entrance and episode one of this seven-part series 'One Ocean' began with him standing on the bow of the 54 metre superyacht support vessel Umbra while a pod of dolphins frolicked in the bow wake. Launched by Dutch yard Damen in 2008, Umbra was refitted in 2014 to add a large helipad to her aft deck, which can be briefly seen in the BBC's spectacular aerial footage. 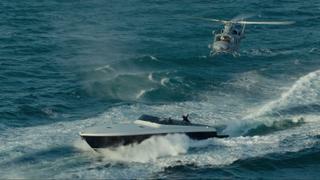 The first episode also showed cameramen using a Zodiac RIB to film dolphins surfing off the coast of South Africa, while episode two 'The Deep' featured the 55 metre Auroux expedition yacht Alucia, which was used to launch a pair of deep dive submarines, as Eyos Expeditions recently revealed. Sir David Attenborough recently returned to the small screen with his latest BBC nature documentary Blue Planet II. The renowned naturalist certainly knows how to make an entrance and episode one of this seven-part series 'One Ocean' began with him standing on the bow of the 54 metre superyacht support vessel Umbra while a pod of dolphins frolicked in the bow wake. Launched by Dutch yard Damen in 2008, Umbra was refitted in 2014 to add a large helipad to her aft deck, which can be briefly seen in the BBC's spectacular aerial footage. 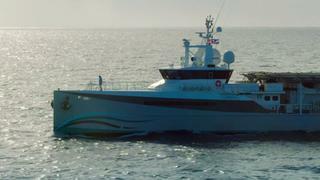 The first episode also showed cameramen using a Zodiac RIB to film dolphins surfing off the coast of South Africa, while episode two 'The Deep' featured the 55 metre Auroux expedition yacht Alucia, which was used to launch a pair of deep dive submarines, as Eyos Expeditions recently revealed. The glitz and glamour of superyachts makes them ideal stars for blockbuster movies and big-budget television shows. The 55.4 metre superyacht Turquoise _— having starred in the new Sky Atlantic series _Riviera. Launched by Turkish yard Turquoise Yachts in 2011, Turquoise features British design, with the late Ed Dubois penning her exterior lines and London-based studio H2 Yacht Design styling her lavish interiors, which can accommodate up to 12 guests and 13 crewmembers. Her star features include a Jacuzzi on the upper deck and two Caterpillar 3512B engines that allow for a top speed of 16.5 knots. Currently offered for sale, Turquoise can carry up to 83,000 litres of fuel, meaning that she can cruise across the Atlantic at a stately 12 knot speed without needing to fill up. 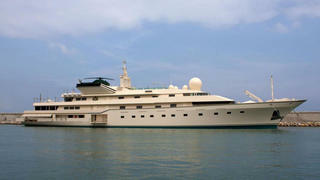 The glitz and glamour of superyachts makes them ideal stars for blockbuster movies and big-budget television shows. The 55.4 metre superyacht Turquoise _— having starred in the new Sky Atlantic series _Riviera. Launched by Turkish yard Turquoise Yachts in 2011, Turquoise features British design, with the late Ed Dubois penning her exterior lines and London-based studio H2 Yacht Design styling her lavish interiors, which can accommodate up to 12 guests and 13 crewmembers. Her star features include a Jacuzzi on the upper deck and two Caterpillar 3512B engines that allow for a top speed of 16.5 knots. Currently offered for sale, Turquoise can carry up to 83,000 litres of fuel, meaning that she can cruise across the Atlantic at a stately 12 knot speed without needing to fill up. Superyachts and Hollywood go hand in hand, with dozens of luxury yachts attending the Cannes Film Festival every year, but only a select few have been immortalised on the silver screen. 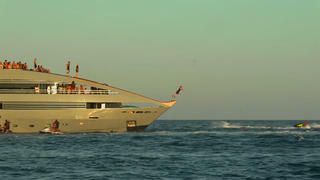 One of the most recent examples is the 40 metre Sunseeker yacht Thumper, which stars in Absolutely Fabulous: The Movie. In the film, Edina (Jennifer Saunders) and Patsy (Joanna Lumley) flee to the South of France after a fatal accident involving British supermodel Kate Moss. The yacht serves as a luxury hideout for the scandalous pair, and Saunders told The Daily Telegraph that filming on board was a delightful experience: “This is the life! This afternoon’s filming takes place on Thumper, a Sunseeker yacht so big that I can’t actually fit it on to the screen of my iPad to take a picture,” she added. Currently listed for sale, Thumper recently received a significant price cut. Superyachts and Hollywood go hand in hand, with dozens of luxury yachts attending the Cannes Film Festival every year, but only a select few have been immortalised on the silver screen. 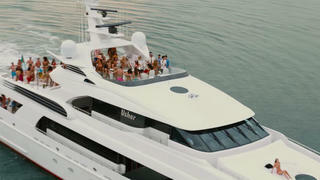 One of the most recent examples is the 40 metre Sunseeker yacht Thumper, which stars in Absolutely Fabulous: The Movie. In the film, Edina (Jennifer Saunders) and Patsy (Joanna Lumley) flee to the South of France after a fatal accident involving British supermodel Kate Moss. The yacht serves as a luxury hideout for the scandalous pair, and Saunders told The Daily Telegraph that filming on board was a delightful experience: “This is the life! This afternoon’s filming takes place on Thumper, a Sunseeker yacht so big that I can’t actually fit it on to the screen of my iPad to take a picture,” she added. Currently listed for sale, Thumper recently received a significant price cut. When American film director Ericson Core set about remaking the 1991 extreme sports movie Point Break, he turned to the world of superyachts to give his 2015 version an extra helping of glamour. Ocean Emerald, the 41 metre from Rodriquez Yachts, was used as a key filming location, with a skateboarding ramp fitted to the bow, for some spectacular stunts. When American film director Ericson Core set about remaking the 1991 extreme sports movie Point Break, he turned to the world of superyachts to give his 2015 version an extra helping of glamour. Ocean Emerald, the 41 metre from Rodriquez Yachts, was used as a key filming location, with a skateboarding ramp fitted to the bow, for some spectacular stunts. When US comedy series Entourage was given the Hollywood treatment in 2015 it was only fitting that the party-loving boys should be seen living the high life on a glamorous yacht. Delta Marine’s 2007 launch Usher (ex-Mr Terrible) took on a starring role by hosting a yacht party in the film’s opening scene, before lead character Vincent Chase (Adrian Grenier) embarks on a disastrous career directing movies. Movie fans hoping to recreate this scene can charter Entourage yacht Usher through Northrop & Johnson, with rates starting from $175,000 per week. When US comedy series Entourage was given the Hollywood treatment in 2015 it was only fitting that the party-loving boys should be seen living the high life on a glamorous yacht. Delta Marine’s 2007 launch Usher (ex-Mr Terrible) took on a starring role by hosting a yacht party in the film’s opening scene, before lead character Vincent Chase (Adrian Grenier) embarks on a disastrous career directing movies. Movie fans hoping to recreate this scene can charter Entourage yacht Usher through Northrop & Johnson, with rates starting from $175,000 per week. 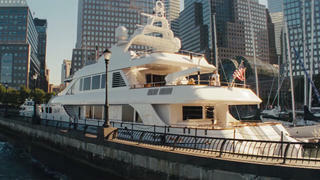 Another film star yacht that is available for charter, Lady M played a crucial role in 2013 film The Wolf of Wall Street. When Jordan Belfort (Leonardo DiCaprio) hits the big time, he splashes out on the luxury yacht and names it Naomi after his second wife (as played by Margot Robbie). However, the film takes a disastrous turn when the superyacht sinks during a stormy passage between Porto Cervo and Capri — a scene that closely mirrors Belfort’s real-life yachting disaster in 1997. Directed by Martin Scorcese, The Wolf of Wall Street was one of the most successful movies of 2013, grossing more than $116 million at the box office. Another film star yacht that is available for charter, Lady M played a crucial role in 2013 film The Wolf of Wall Street. When Jordan Belfort (Leonardo DiCaprio) hits the big time, he splashes out on the luxury yacht and names it Naomi after his second wife (as played by Margot Robbie). However, the film takes a disastrous turn when the superyacht sinks during a stormy passage between Porto Cervo and Capri — a scene that closely mirrors Belfort’s real-life yachting disaster in 1997. Directed by Martin Scorcese, The Wolf of Wall Street was one of the most successful movies of 2013, grossing more than $116 million at the box office. Ewan McGregor and Scarlett Johansson both appeared in this Michael Bay film, but the real star was Galeocerdo. This futuristic WallyPower 118 superyacht is literally the stuff of dreams, as McGregor’s character Lincoln Six Echo has a recurring dream where he wins the lottery and escapes his mundane life aboard a luxury yacht called Renovatio. But when his dreams come true, he discovers a sinister plan that must be stopped. The Island was met with mixed reviews upon its release in 2005, with Empire magazine describing it as “full of energy and incredibly pretty but burdened with only the minimum of smarts”. Ewan McGregor and Scarlett Johansson both appeared in this Michael Bay film, but the real star was Galeocerdo. This futuristic WallyPower 118 superyacht is literally the stuff of dreams, as McGregor’s character Lincoln Six Echo has a recurring dream where he wins the lottery and escapes his mundane life aboard a luxury yacht called Renovatio. But when his dreams come true, he discovers a sinister plan that must be stopped. The Island was met with mixed reviews upon its release in 2005, with Empire magazine describing it as “full of energy and incredibly pretty but burdened with only the minimum of smarts”. No round up of the best superyachts on film would be complete without a mention of Britain’s most famous spy, James Bond. 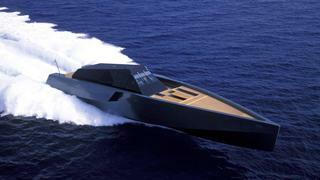 The 007 franchise has featured numerous yachts over the years, from Northern Cross in Goldeneye to Moonmaiden II in The Living Daylights, however, one stands out above all others. The 86 metre Benetti yacht Kingdom 5KR (ex-Nabila) doubled up as Disco Volante, the floating base of arch-villain Ernst Stavro Blofeld in Never Say Never Again, the 1983 remake of Thunderball. Launched in 1980, Kingdom 5KR was only recently overtaken as the Benetti flagship by the 90 metre superyacht Lionheart. No round up of the best superyachts on film would be complete without a mention of Britain’s most famous spy, James Bond. The 007 franchise has featured numerous yachts over the years, from Northern Cross in Goldeneye to Moonmaiden II in The Living Daylights, however, one stands out above all others. The 86 metre Benetti yacht Kingdom 5KR (ex-Nabila) doubled up as Disco Volante, the floating base of arch-villain Ernst Stavro Blofeld in Never Say Never Again, the 1983 remake of Thunderball. Launched in 1980, Kingdom 5KR was only recently overtaken as the Benetti flagship by the 90 metre superyacht Lionheart. Daniel Craig's recent turns as 007 brought a new generation of beautiful sailing yachts onto the big screen, the most notable of which being Regina. This 56 metre steel schooner from Pruva Yachting starred in the 2012 film Skyfall as Chimera, the yacht which carried James Bond to villian Raoul Silva's island hideaway. Preparing the yacht for filming was an arduous process, including re-upholstering inside and out, as owner Doğukan Boyacı explained. "We did lots of modifications. It was really very difficult but we succeeded finally,” he added. 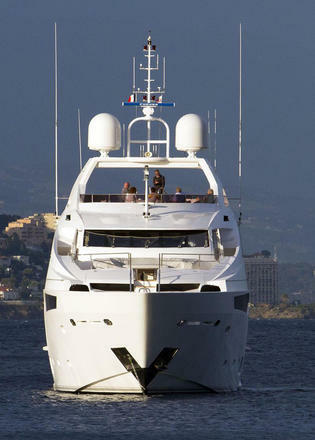 Currently available for charter, Regina is based in the East Mediterranean and prices start at €70,000 per week. Daniel Craig's recent turns as 007 brought a new generation of beautiful sailing yachts onto the big screen, the most notable of which being Regina. This 56 metre steel schooner from Pruva Yachting starred in the 2012 film Skyfall as Chimera, the yacht which carried James Bond to villian Raoul Silva's island hideaway. Preparing the yacht for filming was an arduous process, including re-upholstering inside and out, as owner Doğukan Boyacı explained. "We did lots of modifications. It was really very difficult but we succeeded finally,” he added. 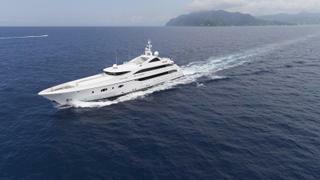 Currently available for charter, Regina is based in the East Mediterranean and prices start at €70,000 per week. As if to prove that every attempt at bringing yachts onto the big screen isn't a glamorous success, BBC One's Top Gear showed how not to do it with their comedy creation. 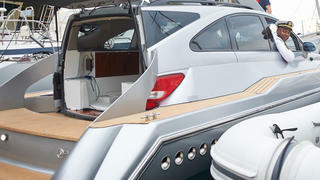 The SsangYacht is a monstrous hybrid of a SsangYong Rodius people carrier and a Sunseeker Hawk 27. Key features included a goldfish tank for a relaxing pedicure and a keyboard for musical entertainment. Reviewing the yacht for Boat International, Eddie Jordan wrote: "It is, quite simply, the worst “boat” I’ve ever been on." As if to prove that every attempt at bringing yachts onto the big screen isn't a glamorous success, BBC One's Top Gear showed how not to do it with their comedy creation. The SsangYacht is a monstrous hybrid of a SsangYong Rodius people carrier and a Sunseeker Hawk 27. Key features included a goldfish tank for a relaxing pedicure and a keyboard for musical entertainment. Reviewing the yacht for Boat International, Eddie Jordan wrote: "It is, quite simply, the worst “boat” I’ve ever been on."